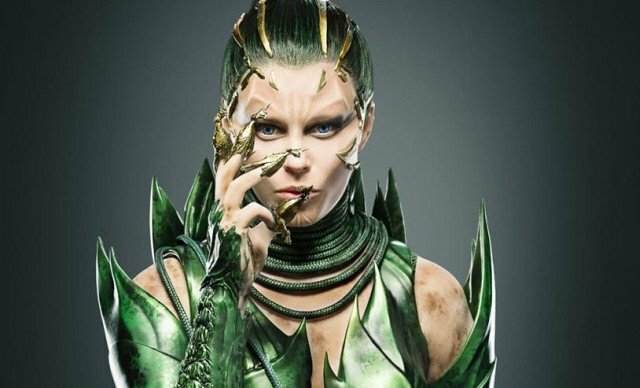 We’ve gotten a handful of shots of Elizabeth Banks in her head-to-toe Rita Repulsa garb over the past few weeks, but today a new outfit has been spotted on the set of the currently-filming reboot of Saban’s Power Rangers. In the new photos, Rita’s gear is far more rudimentary and basic, suggesting this could be an early part of the film before she goes full-on villain. As CBM points out, her dusty outfit could be a call-back to the original series’ origin of the character, who escaped from a 10,000 year imprisonment in space and set off the events of the show. In one image she’s seen embracing Kimberly Hart (Naomi Scott), but sources on the set mentioned that the scene also featured Rita “draining the life out of the five Rangers,” so it’s probably not any kind of loving embrace. Questionably, there have been rumors suggesting Banks’ version of the character will have connections to the Dragon Coin, known to give the Green Ranger powers, but there’s been no confirmation on that just yet. In the final photo from today, six mysterious, metallic objects are seen on the set in brightly colored hues that nearly suggest connections to each Ranger. The colors match up with previous reports of the five announced Rangers in the film – red, blue, black, pink, and yellow – and yet there’s a sixth silver-ish color left over, and no green in sight. Check out the full gallery of the new images below and see for yourself. As the rumors and speculation mount for Saban’s Power Rangers, we’ll be sure to keep you updated, so stay tuned.